QB: Kyler Murray (2017 — 18 of 21 for 359 yards, 3 TDs and no INTs, as Baker Mayfield’s backup; Texas history — he didn’t play last year against the Longhorns. Known fact: The Big 12 is the best offensive league in the country. Need a stat to back that up? A league team has finished first in the country in total offense for five straight seasons. Oklahoma sat atop the national rankings a year ago, averaging 580 yards a game. They lost in double overtime in the national semifinals, but only after scoring 48 points. The Sooners sported a dream-like offensive cast, led by Heisman quarterback Baker Mayfield, who also was the top pick of the NFL draft. OU had a tremendous offensive line, the best tight end in the nation in Mark Andrews, a 1,000-yard rusher in Rodney Anderson and a bevy of talented wideouts. But what will OU look like this year? How will they fill so many holes? As coaches know, raw inexperience can negate pure talent, especially if there’s no effective leadership. That’s why the OU quarterback will be the most scrutinized player in the Big 12. 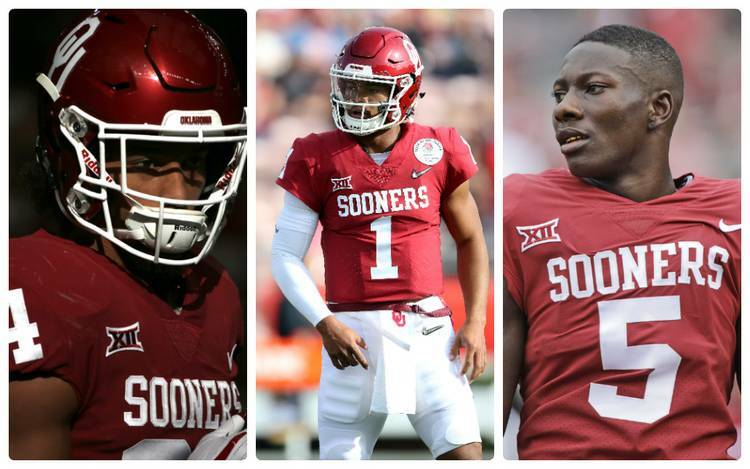 Riley won’t say who will be the starter, whether it’s Kyler Murray or Austin Kendall. Most believe it’ll be Murray, the one-time five-star prospect and national Gatorade player of the year who originally signed with Texas A&M. Murray was 42-0 in his three seasons as a starter at Allen High School. But Murray hasn’t enjoyed that sort of success in college. This will probably be his last season in Norman. Earlier this summer he signed a $4.6 million contract with the Oakland A’s after the team selected him with the ninth pick of the major league draft. Murray’s baseball agent, Scott Boras, told The Athletic that Murray has a very “defined path” with baseball and would only be playing football for one more season. Riley said before preseason camp stared last week that he wasn’t certain this will be Murray’s final season. And Murray seemed to leave the door open when he spoke with the media earlier this week. Murray hasn’t been relied upon to carry an offense since he was a freshman at A&M in 2015. In his first career start with the Aggies, he threw for 223 yards and rushed for 156. He was only the second SEC quarterback in the past 20 years to run and throw for more than 100 yards in his debut. The other was Cam Newton. Kendall, who was a four-star prospect when he signed in 2016, redshirted last season. The rest of the Sooners offense can make the quarterback’s job far easier, no matter who eventually starts. Tailback Rodney Anderson gained 1,118 yards last year. He averaged 113 yards per game against ranked teams. He emerged as OU’s main back in late October. And as the go-to guy, he gained 100 yards or more in six of the Sooners’ final eight games. He rushed for 201 in the national semifinal loss to Georgia. OU also will field a talented group of receivers; Marquise Brown, who had 1,095 yards a year ago, leads the pack. CeeDee Lamb also returns after posting 807 yards a year ago. Grant Calcaterra, who was Andrews’ backup a year ago, probably will start at tight end. As Riley said, OU has all the makings of a balanced, difficult to defend sort of offense. It remains to be seen whether it will measure up to last year’s bunch, which led the nation in total yards and produced the Heisman winner.